Coventry City have appointed Tony Mowbray as their new manager. The 51-year-old Yorkshireman, who succeeds the sacked Steven Pressley, was officially unveiled at a Tuesday lunchtime press conference. The former Hibernian, West Bromwich Albion, Celtic and Middlesbrough manager has been out of football since leaving Boro in October 2013. "We've secured the services of a highly-rated, experienced candidate," said chief executive Steve Waggott. "Tony is a manager who has enjoyed plenty of success at a higher level. He has experience in coming into a club in challenging times and steering them through to safety and, on top of that, has enjoyed promotion too." Mowbray's first managerial appointment was as caretaker boss with Ipswich Town following George Burley's departure in October 2002. He then got his first big chance in Scotland in May 2004 with Hibernian, where he was a relative success, his side having won more than half their games under him. He returned to England with West Bromwich Albion in October 2006, replacing Bryan Robson, leading the Baggies to the Championship title in 2008. Albion were relegated from the Premier League a year later and Mowbray left to join Celtic. Mowbray spent just nine months in charge of Celtic, being sacked in March 2010. Seven months later, he rejoined his boyhood club Middlesbrough, with whom he had spent the majority of his playing career. He was at Boro for three years, enjoying a best-placed finish of seventh in the Championship in 2012. 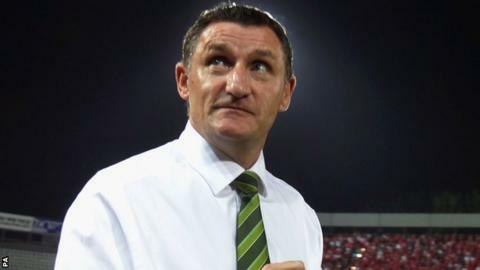 Mowbray, who has been appointed until the end of the season, becomes the club's 12th manager in 13 and a half years since the sacking of Gordon Strachan in September 2001. He starts his reign with Coventry currently in 20th place in League One, a point clear of the relegation zone. But he takes charge of a team who have shown their potential by picking up four points out of a possible six from their past two matches, both against teams in League One's top six. The Sky Blues were in the bottom four when Pressley was sacked on 23 February after two years in charge. But Saturday's surprise 2-1 home win over MK Dons under the caretaker charge of Dave Hockaday and Neil MacFarlane, their first victory at the Ricoh Arena for four months, lifted them back out of trouble. "We wanted someone who could come in and hit the ground running," added Waggott. "We have 14 important games left this season and the number one priority is to preserve our League One status. "We were all very impressed with Tony during the interview process and it speaks volumes that the club are able to attract a manager of his calibre."